Thinking of you and your family Daryl. So sorry for your loss. Tom and Joanne. So sorry to read about your loss. You are in my thoughts. My deepest condolences to Darryl and all her family. My thoughts are with you today and for days to come. We are so sorry for your loss. Thinking of you and your family. So sorry to hear of Maureen’s passing. Sending loving thoughts and prayers your way, Daryl and family. Our condolences to you and your family Daryl. So sorry to hear of Maureen’s passing. We are so sorry to learn of Maureen’s passing. Our thoughts go to you and your family. Jack and I are sending heartfelt condolences from Ontario, when we were first in BC we had and oppuntity to check out a float camp and Darryl and Maureen , were one of our first stops . Maureen will always be remembered ! Darryl , so sorry to hear of Maureen’s passing. Our deepest sympathies and condolences to You, Laurie, Bruce and family. Heartbreaking news, Maureen was beautiful, kind and classy and will always be remembered fondly. May she RIP. Sending You huge hugs at this difficult time. So sorry for your loss Darryl,Our deepest condolences to you and your family. Walt and Rita Hall and family. So very sorry to hear this news. My heartfelt condolences. So sorry for your loss Daryl and Family. You are in our thoughts. Sorry for your lost, sending my condolences to you and your family. So sorry to hear this news. Our deepest condolences to you and your family. So sorry to hear of the passing of Maureen. She was a beautiful Lady and our deepest condolences are sent to you and your family. She will be missed. As tears leak from my eyes and drop onto the desk pad my heart is breaking for all of you. Maureen was such a vibrant woman for so long and a fabulous neighbour. I remember being envious of the way she was always “turned out”. I am so sorry for your tremendous loss, Daryl, Bruce and Laurie. Hugs to you all. Daryl, we are so sorry to hear of the recent passing of Maureen. Our deepest condolences to you, Bruce and Laurie. We are so sorry to hear of the passing of Maureen. Take care. Heaven received an angel…so very sorry to hear and so sad for those of us who lost her….gone but not forgotten!! Sorry to hear this sad news. Our best wishes to all Maureen’s loved ones. 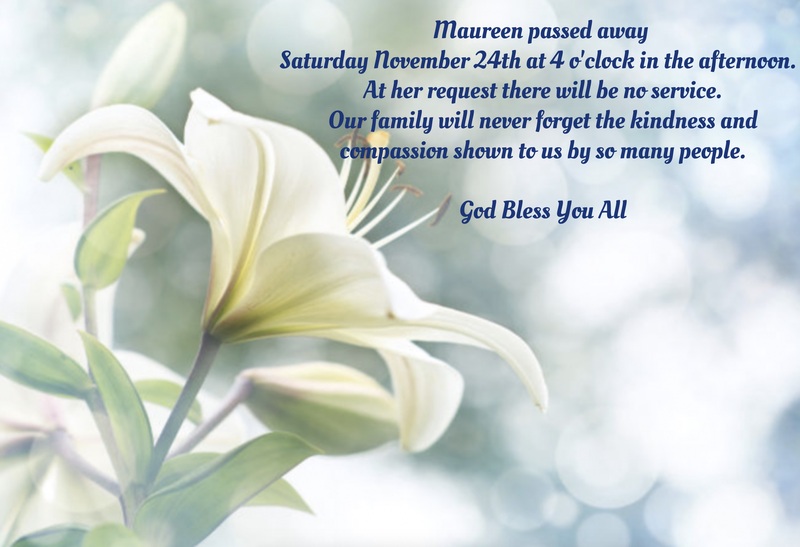 Such a great loss to the community and to everyone that knew Maureen. My heart is breaking for the family and I pray for their serenity. Rest In Peace Maureen you will be missed by many. Daryl, Our deepest heartfelt condolences. I’ll never forget the kindness that Maureen showed to us over the years being neighbours. May you find some comfort in the memories you shared. A heartfelt thank you to everyone for your love and caring comments at this very painful time. Your kind words and wishes are helping us get through each day. Love Bruce, Audrey, Laurie, Scott, Meghan, Cj, Jesse & Daryl. We are so very sorry for your loss. We send our sinceriest condolences to you and your family. Hold your memories near, lean on your friends and family through this journey. Very sad to hear this news, Daryl. To “Bad Moon Rising” , family and friends of family – my thoughts have been with you and Dannny Ball since your losses. I hope the memories and close family will assist you to get through this time of year. Will call early in the new year – sincere condolences to you both. Frogwon.